For most Americans, it had probably been a while since they had reason to think about iconic French actor Gérard Depardieu. Sure, he’s made Stateside film appearances here and there. “Green Card.” “My Father, the Hero.” That ridiculous Ridley Scott debacle where he played Christopher Columbus. But he’s hardly a household name, and he’s focused largely on movies lately that… how shall I put this… have no chance of actually appealing to Americans in any way, shape or form, what with all them foreign-y words and lack of fighting space robots. But today, today Depardieu’s name was on everyone’s lips, both in the US and abroad. For today, word spread that the actor – waiting an unbearably long time on the tarmac for a flight from Dublin to Paris – simply stood up and relieved himself right there in the airplane’s aisle. 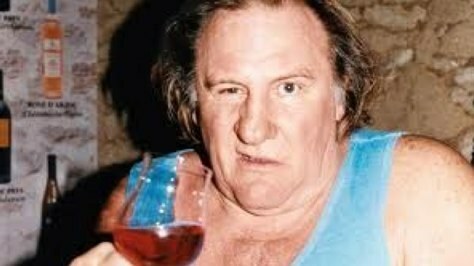 Depardieu seen here in character as the French guy from that early “Simpsons” episode who put antifreeze in his wine. The whole ugly incident (and I don’t use that term lightly) inspired Alby Thompson’s list of Celebrities Who Have Behaved Badly on Airplanes. Most surprising? Christian Slater got caught at New York’s JFK Airport trying to board a plane with an unlicensed gun in his luggage. I’ll repeat myself, because that is so ridiculously stupid, and I don’t trust you to go back and re-read the last sentence for comic effect. HE WAS TRYING TO BOARD A PLANE WITH AN UNLICENSED GUN IN HIS LUGGAGE. Bear in mind, though, this was a pre-9/11 world, where passengers frequently engaged in casual, spontaneous games of Russian Roulette to pass the time on trans-continental flights. Maybe I’ll just keep the entire can of 7 Up. What are you gonna do about it, smart guy?